← Pictures of you. Pictures of me. I’ve been deep in the trenches of turning my lackluster guest bedroom into a more sophisticated guest bedroom/office space. One of the key objectives was to create a space that would fuel creativity for the design work and many crafty projects that I do at home and there’s no better way to do that than with a DIY inspiration board! I found the frame at Goodwill months ago but hadn’t been quite sure what to do with it. 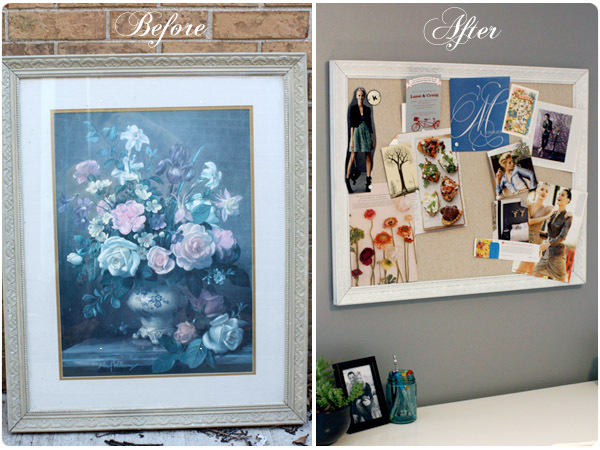 Finally with the inspiration board in mind, I ditched the blah artwork and transformed the frame into a pretty and functional creative center by covering an old bulletin board with some nubby, neutral fabric. *Adjust the yardage based on the size of your bulletin board. 1. Spread out your drop cloth in a well-ventilated area. 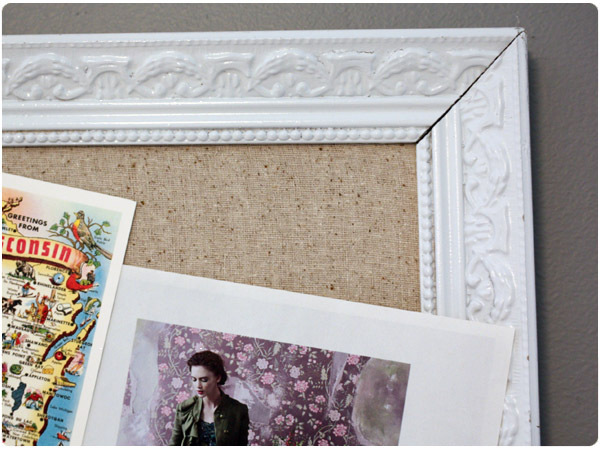 Spray paint your empty picture frame. Dry and spray a second coat. Dry. 2. Measure the inside of your frame. Transfer the measurements to the center of your bulletin board, marking off cutting lines to fit inside the frame. 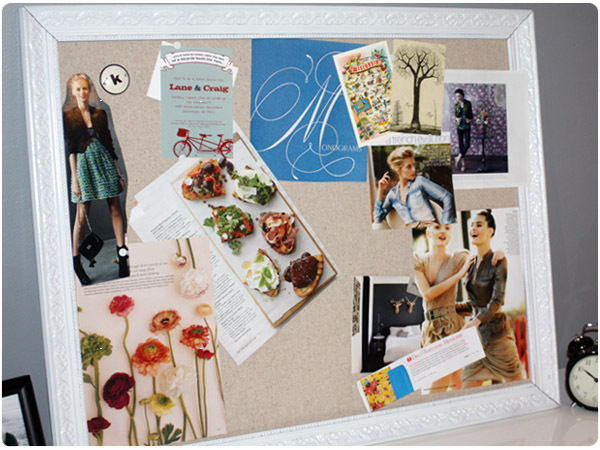 Tip: Just buy a cheapo bulletin board from Target or a craft store…or use one you already have. It doesn’t need to be nice since you’ll be cutting it apart. 3. Carefully and slowly use a box cutter to cut through the bulletin board along the cutting lines. Cut each side and pop the piece out. Scrape any messy edges so that the edges are fairly smooth. Tip: Since you’ll be cutting through the board with some pressure, be sure to cut on a safe surface that you don’t mind poking or scratching. I did it on the floor in my basement. 4. Iron your fabric and stretch it out on a large flat surface. 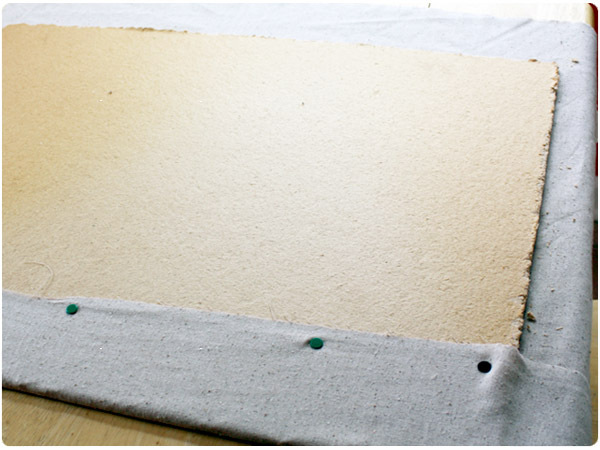 Place your bulletin board on top of the fabric, cork side down. 5. 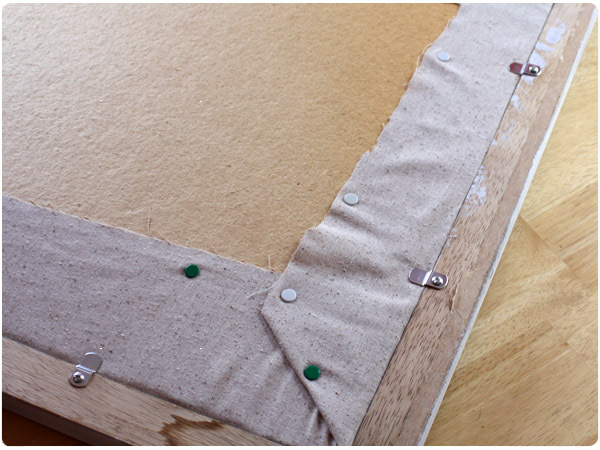 Start by folding the fabric over the edges of the board, leaving a few inches beyond the edge. Trim excess if necessary. 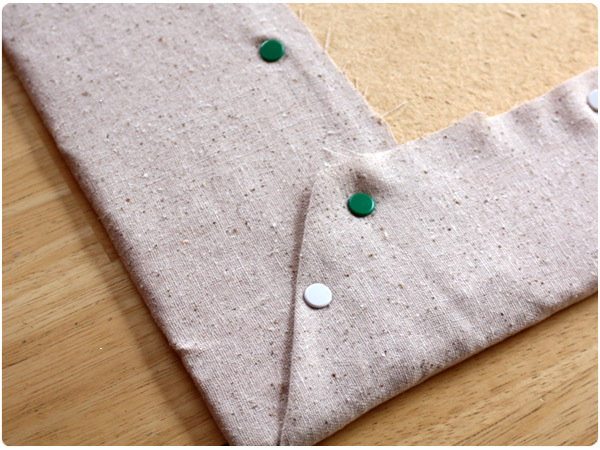 Fold in the corners to form right angles and pull the fabric tightly across the back of the board. Secure with a thumbtack or a staple gun. Repeat for each side of the board. 6. Press covered bulletin board into the empty frame. Place two frame clips evenly spaced along the inside edges of the frame. Screw each clip securely into the frame. 7. Measure equally from the top edge of the frame the sides and mark where you will place your frame hangers. This will make it easier to hang the frame level on your wall. 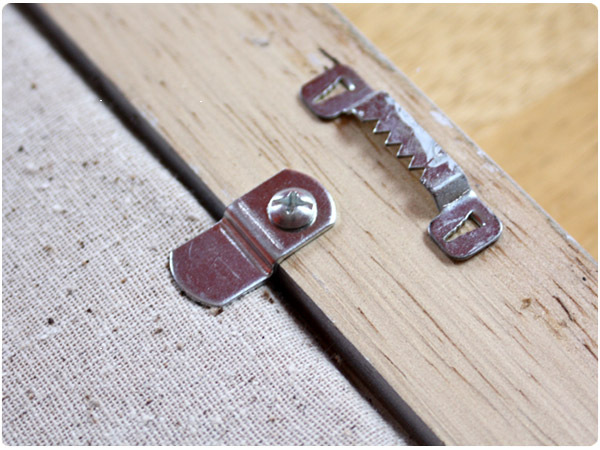 Press or nail the sawtooth hangers into the back of the frame. Stay tuned to see the rest of my office makeover coming soon! Love it. Bet I could do this for some 4H projects needing frames. Love it…just added to it today…it’s awesome to have it before your eyes every single day!